Pantethine is a derivative of vitamin B5. Pantethine supports lipid metabolism by its ability to raise levels of CoA, a cofactor involved in several metabolic pathways including carbohydrate and lipid metabolism. CoA combines with acetyl groups to form Acetyl CoA, a key participant in energy production via its role in the Krebs (citric acid) cycle within the mitochondria. Recommended uses include adrenal fatigue, Parkinsons, and elevated blood lipids. Pantesin ® is a trademark of Daiichi Pharmaceutical Co., Ltd. and is licensed to Daiichi fine chemicals. 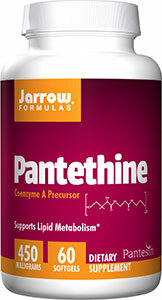 Pantethine is a premier energy boosting and metabolic support nutrient. It is a derivative of vitamin B5 (pantothenic acid). This derivative (pantetheine) is double bonded with sulfur to form the dietary supplement ingredient, pantethine. The sulfur bond enables pantethine to have special biological activity that vitamin B5 does not have. Pantethine is the immediate precursor to Co-Enzyme A (CoA). Supplemental pantethine raises the levels of CoA. CoA is a pivotal nutrient in at least 70 metabolic pathways, including those involved with the healthy metabolism of fats, carbohydrates, and amino acids. CoA is required for cell engines (mitochondria) to produce energy properly. CoA helps synthesize acetylcholine, an important compound for nerve function and memory, and protects dopamine levels making it important for Parkinson's patients. It supports Phase II detoxification and the enzyme aldehyde dehydrogenase that helps clear alcohol and related derivatives. And it helps synthesize glyconutrients like N-Acetyl-Glucosamine, needed for healthy joints and the lining of the GI tract. Dopamine is the key transmitter in your brain associated with motivation and drive, and is linked to reward. Alterations in dopamine function manifest in different ways and can be as basic as excessive food cravings or stress intolerance or as advanced as major depression, addiction, adrenal fatigue, Parkinson’s, and even psychosis/schizophrenia. A new study shows that pantethine has the ability to directly protect dopamine neurons. In this particular experiment the researchers used the MPTP neurotoxin (1-methyl-4-phenyl-1,2,3,6-tetrahydropyridine) that causes permanent symptoms of Parkinson’s disease by damaging neurons in the substantia nigra of the brain. Scientists have known for a long time that various ketones, an important metabolite of calorie metabolism – especially of fat, have a highly protective effect on nerves. Because ketones need CoA to form and because pantethine produces CoA, they sought to test whether pantethine could work to protect against toxic-induced nerve degeneration that mimics Parkinson’s. Pantethine was able to stop the decline in ketones that otherwise occurs with MPTP exposure and in so doing was able to completely arrest the destruction of dopamine neurons. This is one mechanism of pantethine’s significant ability to help metabolism and is a very significant finding when you consider how many health problems, both physical and mental, are associated with disruption of dopamine function. While pantethine supports many aspects of human nutrition, it has become a very popular nutrient for cardiovascular support. It not only supports the healthy metabolism of cholesterol and triglycerides, it also promotes healthy platelet cell membranes. Cholesterol is a normally produced substance that needs to be moved naturally in metabolic processes in order to sustain survival. Pantethine provides energy to move cholesterol in normal metabolism.When combined with a proper diet and exercise, pantethine helps restore the natural metabolism of cholesterol. Pantethine directly supports the normal formation of HDL cholesterol (helps make Apo A-I and Apo A-II that are needed to form HDL). Pantethine also promotes the healthy function the enzyme called HMG CoA reductase, an important enzyme in the normal regulation of cholesterol. Triglycerides are the natural way the body packages energy for storage. Stored body fat is composed of triglycerides and there are triglycerides in the blood that are either on their way to storage or available as a fuel source to sustain energy and metabolism. One goal of weight management is to create a favorable metabolic environment where triglycerides are broken down to be used as fuel, which is why proper diet and exercise are so important. Pantethine has been shown to support the liver's metabolism of fatty acids, thereby assisting natural triglyceride metabolism. Pantethine, in conjunction with a proper diet and exercise, is an excellent weight management nutrient. Red blood cells and platelets function best when cell membranes have the right balance of fatty acids in the membranes. This helps them to move more naturally in circulation with less resistance and enables them to perform normal functions more effectively. Pantethine promotes the healthy formation of blood cell membranes, including the incorporation of the very important long chain omega 3 oils like DHA into the structure of the cell membranes. It requires energy in the form of Acetyl-Coenzyme A in order to activate the enzyme aldehyde dehydrogenase, which is readily supplied by the nutrient pantethine. 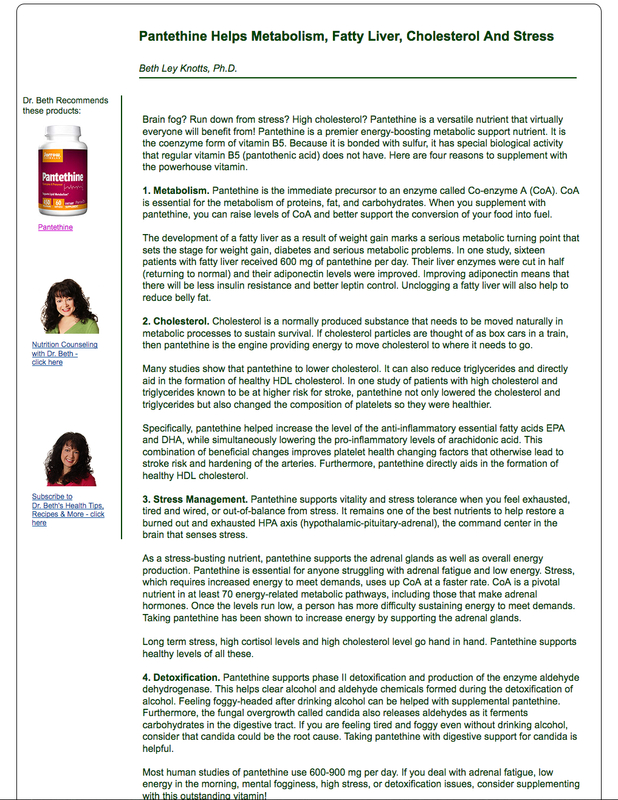 Pantethine can be used to help clear the acetaldehyde of alcohol/hangover, the Candida toxins that cause brain fog, for environmental sensitivity to aldehyde based chemicals like perfumes and nail polish and for the free radical damaged caused by heart attack or even sunburn or respiratory distress, like asthma. This new information gives us a whole new appreciation for this powerful nutrient as a tool to protect cell membranes from free radical damage. This would certainly be important for any health issue of wear and tear, helping to offset the free radical related distress of the issue – no matter what the issue may be. The dose of pantethine used in most human studies is 900 mg per day, though some have been done with 600 mg.